Shoreline Hydrotherapy™ hot tubs are hydrotherapy hot tubs and are fitted with Hydropro™ hydrotherapy jets. 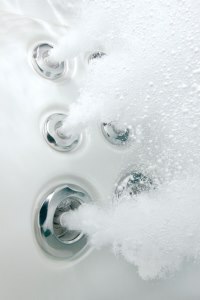 Hydropro™ hydrotherapy jets are unique to Shoreline Hydrotherapy™ hot tubs. They are attractive in design and are long lasting due to special low friction materials, which are utilized to eradicate the need for standard ball bearings, so often the failure of lesser quality jets. Hydropro™ jets are uniquely designed to infuse warm air (see ShoreSeal™ insulation and Re-Heat™ section) into the water in a specially designed patent pending mixing chamber built into the rear of the Hydropro™ jet. This very effectively mixes up to 45% air to 55% water for an invigorating hydrotherapeutic massage. Most Hydropro™ jets are fully adjustable and are all capable of giving you a deep tissue massage. Each seat massages different muscle groups; no two seats are the same in any one Shoreline Hydrotherapy™ hot tub. If you would like more information on our Hydrotherapy Hot Tub Jets, or any of our fantastic range of hot tub and swim spa products and services, then please don’t hesitate to get in touch with our friendly and dedicated team of advisors.